I have been waiting for a way to organise my applications on the iPhone for a long time. Once you have more than 4 screens of applications things start to get either messy or very tedious. Draggig an application with your finger across 4 screens is painstaking. I even thought of taking a set of screenshots of the application icons, then cutting them out and organising them on an A3 paper. Then return to the iPhone and painstakingly drag them around. I've also always thought that iTunes is an abysmal application. It might have been good when it was concieved as a conduit between your local MP3 files and the proprietary communication to the iPod. After that, Apple has just piled on functionality as it has emerged. Today iTunes is a hub for too many things. Where's the logic of activating and updating your phone with a music software? Don't get me started on the interface. I'd easily say that iTunes is Apples worst UI and a catastrophy when it comes to useability. Now iTunes 9 seeks to fix some of these UI horrors. It's got a new iTunes Music Store (which sells vidoes and ring tones and now applications) UI, and so forth. 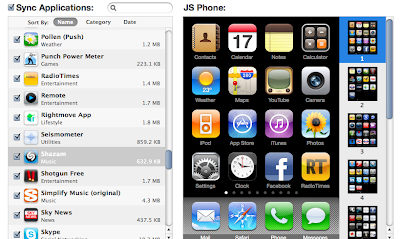 One of the improvements is the UI to organise your applications on the iPhone or iPod Touch. To the left you have a list of all your applications in a sortable list. With a checkbox to install/uninstall the application from the device. In the middle you have the screen from the iPhone/iPod Touch. To the right you have very small thumbnails of the screens, and the application icons. Here's a question for you (and Apple). Why the hell do I need to see three icons of the same application? On top of this, why do you waste my screen real estate with icons so small that I can't be bothered to squint at them? This user interface is absolutely pointless. It's also very cumbersome. You can drag applications between the different columns and screens, but the logic is a bit cloudy. Sure it makes a bit of sense, but it doesn't have to be this confusing. First sack the guy you hired to do this. Tell him to go back to the Windows Vista team and never ever touch a computer again. Second of all, what's wrong with the interface on the actual iPhone and iPod Touch. This user interface is a bliss, both to view and use. It would have been really easy for Apple to have a long horizontally scrollable "Screen" in iTunes. The fixed icons on the bottom of the screen would be fixed to the left. Then you could scroll screen by screen to the left and right. Just like on the iPhone. Having one of those icon-size-slider would allow the user to zoom in-out to view the icons as they please. Overview or details when the user wants. When zooming out far enough there could be more than one row of "screens" so you could get a really good overview. Grabbing the bottom of the screen and dragging would change the location of that particular screen. Grabbing and dragging an icon would naturally change the location of that icon. Well, what about the applications you've bought, but don't want on your device. Well, they'd be located to the left of the home screen, say with a white background so the user would see that they're not on the device's black background. Dragging them from there would put them on the device. You could even have tabs on top of this/these screens to sort the applications. Why they have not implemented this obvious user interface is beyond my comprehension. But then again I would never have come up with the idea of using an MP3 playing software to buy movies, download operator updates. Right, back to squinting at those icons. Bhlergh.